We are one of the recognized names in the market, highly indulged in providing a huge assortment of Latex Household Gloves to our customers. 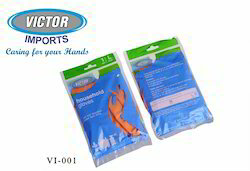 These provided gloves are highly known for their perfect finish and smooth texture. These gloves are highly used in hospitals and clinics for cleanliness. For all your household jobs. latex household gloves are dermatologically tested and made from a polymer, they do not contain either the natural rubber protein or the chemical accelerators which are the usual cause of sensitivity to rubber. The soft viscose lining gives ultimate comfort, whilst the soft vinyl formulation gives increased flexibility. 1) Made from 100% highly purified natural latex. 2) Diamond grip on palm for better handling. 3) Light weight and heavy weight. Cole-Parmer introduces New Sterile and Non-Sterile Latex Gloves.